Smørre­brød, a popular sandwich in Denmark, has made its way to the U.S., proving that a sandwich can be a work of art. Similar to a French tartine, smørre­brød is an open-face sandwich layered with unique and well-thought-out seasonal toppings. The sandwich even makes an appearance in the latest season of The Great British Baking Show during Danish Week. It’s hard to believe this highly Instagrammable sandwich dates back to the 17th century, when farmers out in the fields took baskets filled with bread, butter, smoked fish and sausage and made open-face sandwiches for lunch. Nowadays, Danes continue to enjoy the sandwich, and it’s widely available in cafés, restaurants and lunch boxes across the country. In its simplest form, smørre­brød can be just a slice of dense, seedy Danish rye bread called rugbrød spread with a thin layer of butter. The butter layer plays a key role in preventing toppings and spreads from making the bread soggy. What comes after the butter layer is really the dealer’s choice — meat, cheese, smoked fish, fresh herbs, spreads, pickles and hard-boiled egg are all traditional smørre­brød toppings. 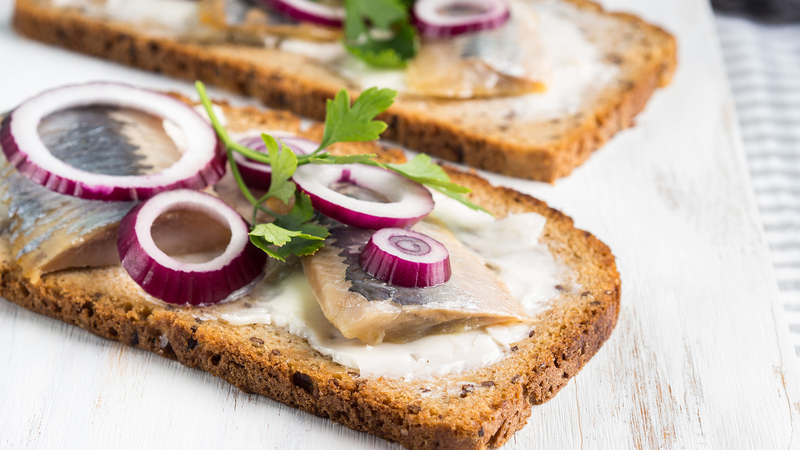 The most popular Danish smørre­brød toppings include small shrimp, sliced hard-boiled egg, pickled herring and fresh produce like beets, fresh herbs, fennel, asparagus and even plums and cherries when in season. Although it sounds like a hodgepodge of ingredients, the toppings should blend harmoniously together rather than fight each other. 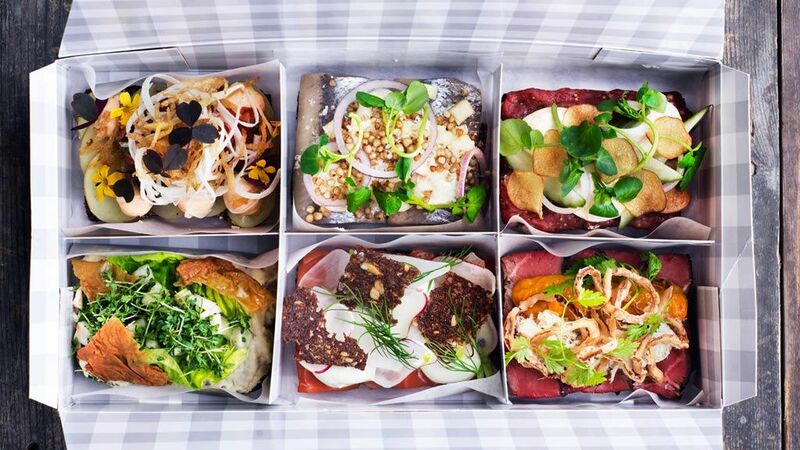 Classic smørre­brød combos include roast beef with pickles and horseradish, shrimp with dill and lemon, gravlax (cured raw salmon) with fresh dill and sour cream and blue cheese with apple with bacon. While smørre­brød hasn’t yet reached avocado toast-level stardom in the U.S., it can be found on select menus across the country. Mikkeller, a beer hall in downtown LA, offers a pork shoulder version topped with pickled red cabbage and apple on fresh rye bread. Great Northern Food Hall in New York’s Grand Central Terminal serves up authentic and inventive Nordic cuisine including an impressive portfolio of smørre­brød creations at Open Rye. Try the juniper-smoked salmon smørre­brød with fennel, apple and horseradish skyr (a mild, yogurtlike cheese) or the vegan beet hummus smørre­brød with mustard, caraway seeds, endive, crispy rye and sumac. Kantine in San Francisco offers an array of smørre­brød, from liver pâté with pickled beets to a fried pickled herring rendition. For the full Copenhagen experience, order their brunch board — sprouted rye bread, a runny egg in creamy spinach, trout salad, spiced bacon, hot rye porridge, house-made skyr and fresh fruit. At Broder Café in Portland, you can get a BLT smørre­brød with bacon jam, arugula, heirloom tomatoes, avocado and dill aioli on rye toast. For something a bit more traditional, try their house-cured gravlax with shrimp skagenröra (shrimp salad) and mustard sauce served on rye. 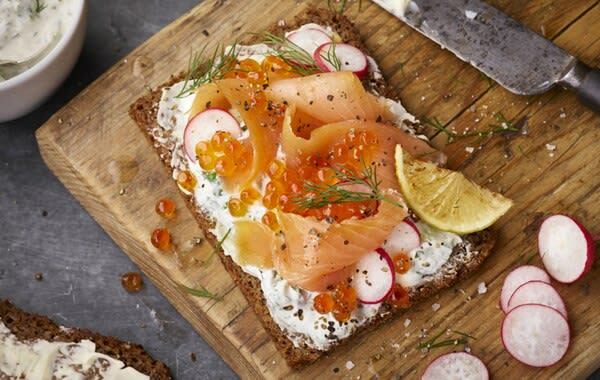 Hungry for smørre­brød but can’t find it at your local Scandinavian joint? You can make it at home with this easy recipe. In a small bowl, whisk the sour cream, horseradish, dill, parsley, lemon zest and lemon juice. Season with salt and pepper to taste. Spread horseradish-dill sour cream on the bread and top with smoked salmon, radishes, dill and parsley. Season with salt and pepper to taste.